The crux of creating a comfortable outdoor space at your home is seating, and the le jardin hammock chairs in this special collection are no exception. 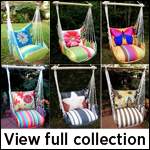 These swings are designed with comfortable cushions offered in a variety of stripes and pastel patterns that infuse bolder colors of yellow, orange and deep blue hues. Choose a design that features a gerbera daisy, butterfly, fish or alligator. Swings in this collection mix modern design with a bohemian lifestyle to create something truly unique. These swings are guaranteed to brighten up your outdoor living space and provide a sense of peace. 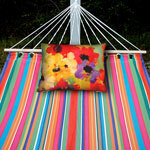 Their comfortable polyester cushions are machine washable and resist mildew and the weather. Each swing supports up to 250 pounds with the help of a 33 inch wooden spreader bar constructed from strong Chilean pine.